Get up close with nature on this 10-night tour of Borneo, one of the most wildlife-rich islands in the world. Stay in jungle camps and take river cruises, spot crocodiles, monkeys and birds in the wild and relax on idyllic beaches. 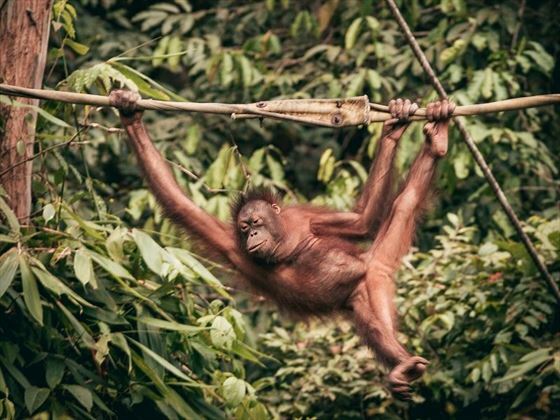 Families of all ages will love this adventure, which takes in Kinabalu National Park, the Kinabatangan River and Sepilok Nature Reserve, ending with a stay on the exotic island Pulau Tiga. Highlights include sleeping in a jungle eco-camp surrounded by nature, taking sunset wildlife cruises along the river, trekking through forests and soaking in thermal hot springs. You’ll also get the chance to see rescued orangutans and Borneo’s iconic Proboscis Monkeys at sanctuaries and meet local villagers. At the end of the trip, you’ll enjoy a tranquil stay on a tropical island, complete with sparkling waters and white-sand beaches (INT). Relax, snorkel and visit mud volcanos on the picture-perfect island Pulau Tiga. 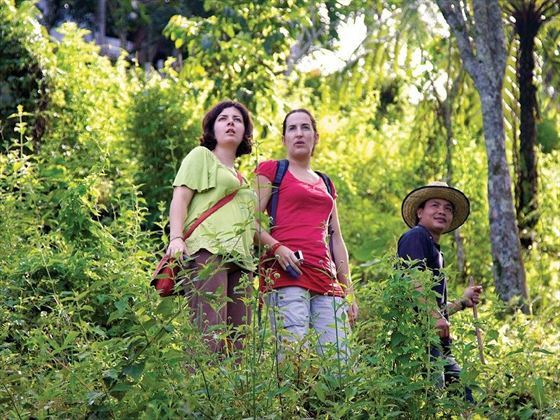 Stay in a jungle eco-camp and visit traditional villages. Visit rescued orangutans at the Sepilok Rehabilitation Centre. Soak in thermal pools at Poring Hot Springs. See Borneo’s long-nosed Proboscis Monkeys and a host of other wildlife. Explore canopy walkways and botanical gardens at Kinabalu National Park. 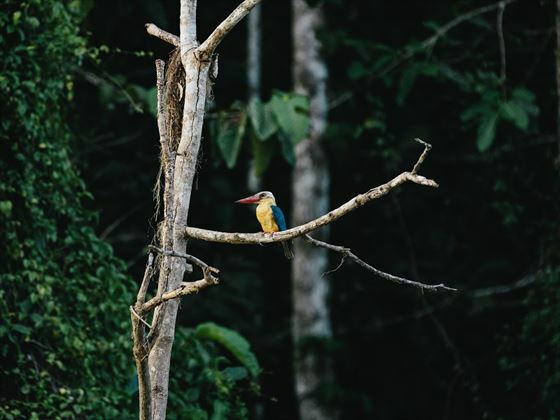 Spot wildlife on jungle river cruises and guided night walks in Kinabatangan. Welcome to Malaysian Borneo! Your adventure starts in the capital of Sabah, Kota Kinabalu. The city is perfectly positioned between the jungle and South China Sea and is full of ancient architecture. There will be a 6pm welcome meeting, but if you arrive early, get out and explore Kota Kinabalu. Wander the picturesque streets, visit the Sabah State Museum or nearby Mari Mari Cultural Village. 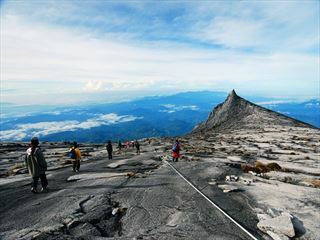 Spend the day at Mount Kinabalu National Park, a UNESCO World Heritage Site named after Borneo’s highest mountain. The park covers over 760 square kilometres and boasts over 4,500 different types of plants, over 326 bird species and over 100 types of mammals. Take a guided walk around the lower trails, which will take you through lush jungle teeming with wildlife. Look out for exotic birds such as Serpent Eagles, as well as monkeys, snakes and all manner of colourful insects. 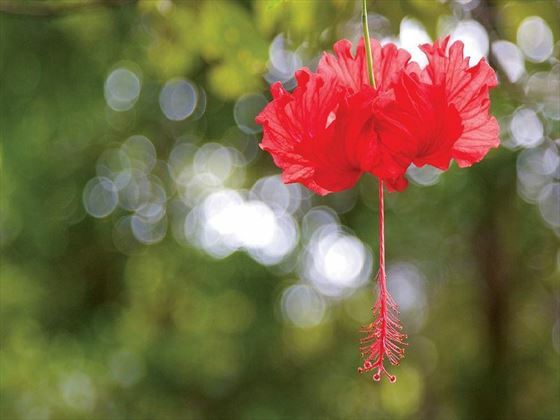 You’ll also get to explore the stunning Botanical Gardens, which showcase diverse native flora and fauna. Spend the rest of the afternoon relaxing. Wake for sunrise views of Mount Kinabalu and then take a one-hour trip to Poring Hot Springs. Soak in the famous, mineral-rich thermal pools, which are thought to have healing powers. You can also take a walk on some of the reserve’s scenic nature trails, including the Canopy Walk, where you can spot wildlife and stop at crystal waterfalls to cool off. Optional activities include visiting the Orchid Conservation Centre and Kundasang War Memorial. In the evening, you’ll stay at a reconstructed longhouse on a tea plantation. These traditional Bornean houses have a long, communal room and are built on stilts. Twin or triple share rooms are simple, with fans and shared bathrooms. Enjoy the peaceful environment and wake to misty morning views of the surrounding fields. Set off on an epic jungle adventure, travelling five hours by private bus to Batu Puteh. This rustic village lies on the banks of the mighty Kinabatangan River, where you’ll be hosted by KOPEL, a local community conservation organisation. KOPEL runs reforestation projects by planting trees and helps local villagers, farmers and fishermen make a sustainable living from the forest. Their work has helped restore over 1,000 hectares of forest, increasing wildlife in the area. You’ll learn all about forest conservation and take a 20-minute boat trip into the jungle to your accommodation near Oxbow Lake. Look out for macaques, crocodiles and distinctive, long-nosed Proboscis Monkeys along the way. After settling into camp, you’ll take a sunset boat trip and an hour-long night walk through the jungle. A guide will point out nocturnal animals and all types of insects along the way. Note that you’ll leave your main luggage at the KOPEL office and take an overnight bag to camp. Don’t forget a torch, rain jacket and insect repellent. Jungle huts have basic facilities with cold water and no electricity, mosquito nets are provided. It’s all part of the adventure! Rise at dawn for another cruise on the river, spotting birds, monkeys and if you’re very lucky, wild orangutans. Afterwards there will be time to rest and soak up the sights and sounds of the jungle in a hammock back at camp. At lunch time, you’ll enjoy a cooking lesson from your local hosts and sample some delicious authentic dishes before returning to the KOPEL base. The afternoon’s activities involve taking a bus to the Batu Tulung burial caves, which date back 900 years and are filled with 125 carved wooden coffins. You’ll get the chance to meet the local villagers and even have a game of football together. Enjoy a traditional music and dance performance before heading back to your jungle camp for the night. Remember to wear conservative clothing when you visit the village, covering your knees and shoulders. Make the two-hour journey by minivan to Sepilok, a nature reserve renowned for its orangutan and monkey sanctuaries. Today you’ll visit the Labuk Bay Proboscis Monkey Sanctuary, where you’ll get a rare chance to watch these unique animals feeding and playing in the forest. It’s estimated that 300 of the long-nosed monkeys, who are only found in Borneo, live in the reserve. Transfer to your Sepilok guesthouse and spend the rest of the day relaxing, there’s a pool at the resort where you can cool off. Today you’ll visit the star attraction, Sepilok Orangutan Rehabilitation Centre, which rescues orphaned and domesticated orangutans. Rather than just keep the animals in a sanctuary, the centre attempts to teach them the life skills they need to be introduced back into the wild. You’ll get the chance to watch these incredible, human-like creatures feed at viewing platforms throughout the day and watch a short film about the centre’s vital work. You also have the option of visiting the Bornean Sun Bear Conservation Center for an additional cost. This relatively new organisation provides sanctuary for rescued Sun Bears, the smallest species of bear in the world. 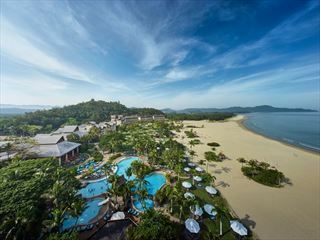 Take a flight back to Kota Kinabalu and drive two-and-a-half hours to Kuala Penyu. You’ll take an exciting speed boat trip to a secluded hideaway on the unspoilt island of Pulau Tiga, where the first series of the American TV programme Survivor was filmed. The island is filled with dense jungle, walking trails and mud volcanoes and is laced with soft, sandy beaches. Take a guided walk to one of the mud volcanos where you can take a cleansing mud bath and then bask in the sun. Wake on your island paradise and after breakfast, embark on a boat trip to nearby Snake Island. This is a key breeding area for both Banded and Yellow-Lipped Sea Kraits, which you may be able to catch a glimpse of on a guided walk. Enjoy snorkelling off a sand spit in clear, topaz waters which are home to over 132 species of fish. If you’re lucky, you might even spot some sea turtles. Take the rest of the day to lie on the beach or explore more of the jungle trails. Wave goodbye to island life and take a speedboat back to the mainland. 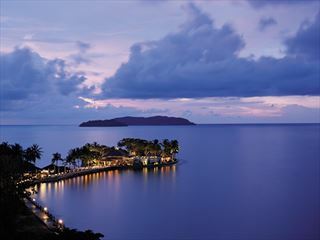 You’ll spend your final evening in a guesthouse on the outskirts of Kota Kinabalu, where you can chill out and digest your Borneo adventures. After breakfast, you’re free to depart the accommodation at any time and there are no activities planned. Take a transfer back to the city to explore or head straight to the airport for your journey home. Accommodation: two nights in a hotel, two nights in a guesthouse, four nights in a jungle lodge and two nights in a resort. Transport: boat, bus, minibus, internal flights, longtail boat, van. Food: 10 breakfasts, four lunches and three dinners. 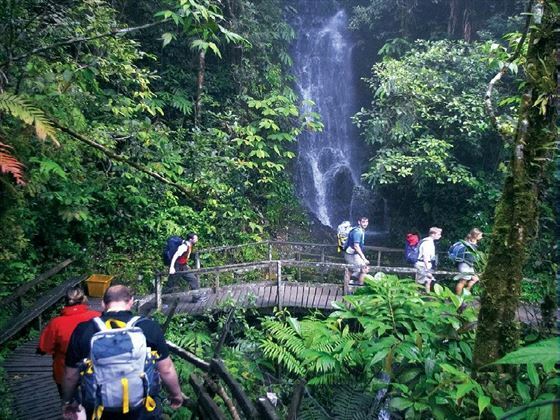 Activities: Mount Kinabalu National Park, guided walking trails and Botanical Gardens. Poring Hot Springs and Canopy Walk, Kinabatangan River sunset and morning wildlife boat trips, night jungle walk, cooking class and cultural show. Sepilok Labuk Bay Proboscis Monkey Sanctuary and Orangutan Rehabilitation Centre. Pulau Tiga National Park, guided walk to mud volcano, Snake Island boat trip and snorkelling.